Johnston County Commissioners have proclaimed this week, September 9 – 15, as Firefighters Week in Johnston County. Each week containing September 11th is also recognized as Firefighters Week in North Carolina. 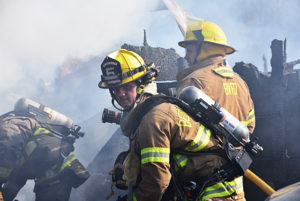 Fighting fires is one of the most hazardous professions requiring physical strength, stamina, extensive training, courage and selfless concern for the welfare of others. Firefighters make scarifies to protect the lives and financial interests of the residents of Johnston County. They respond to emergencies without hesitation. There are currently 24 fire departments, 35 fire stations, and 924 firefighters in Johnston County. Many of the firemen are volunteers. Previous articleWould You Do A Job Like This?